Eyewitness Jose reports on the earthquakes with a magnitude of 7.6 that took place in Costa Rica on 5th September 2012. Fortunately no serious damage was registered. There still are some light aftershocks. Oct. 1, 2012 - PRLog -- It was 8.42 am. As he told me, he was just in the local hardware store when the earthquake began. The owner of the store and he quickly looked at each other, then held to the most stable girder of the building. An eternity later, that in reality just lasted about half a minute, it was over. Outside, some people had laid down on the road. It was as if giant waves have passed through the floor, he described the feeling he had during the earthquake. Slowly people stood up again, Jose told me about the mess that happens to surround him. All the accessories had fallen off the shelves at the hardware store and were spread out on the floor. Despite the unusual situation everybody remained calm. The damage was inspected and people were surprised that not more was broken or collapsed. Jose's greatest concern was for his family and friends, so he drove home as quickly as possible. Once there, the relief was great, everyone was alright, no major damage was caused. The telephone lines and electricity did not work for a few hours but, however were repaired very quickly. Thanks to the good organization of the network operators. Costa Rica had had good luck, says Jose, as in total result of the quake only 2 people were killed, including one who died because of bad heart condition. In other parts of the country the damage was relatively low, as well. Jose told me, that in the afternoon he went to the local beach noticing huge cracks and circular holes or bubbles which were formed in the mud. Since the great earthquake several smaller aftershocks have occurred, Jose tells me pointing out that none of them is comparable in strength or duration. Smaller aftershocks are a normal aftermath of greater earthquake, but the most energy apparently already discharged, that was as well confirmed by experts. Most people have similar stories to tell; the shock was huge, but the damage relatively small. But what exactly happened on 5th September? Costa Rica is in geological terms a very young country. More than 65 million years ago, the Cocos plate was shoved under the Caribbean Plate, by this subduction a chain of volcanic islands was formed which become one land mass as the sea floor was gradually lifted. This process is still in progress, so actually earthquakes are quite common in this region. In consequence of the recent earthquake, the ground in Costa Rica has been lifted about half a meter. Costa Rica thus has become a lot bigger and that way the beaches are broader as well, tourists will certainly appreciate that. With a magnitude of 7.6 the earthquake at the beginning of September was the second largest in the history of Costa Rica; in 1991 there was an earthquake of magnitude 7.7 because of which 50 people died. The slight damage reported, Guanacaste also owes to its favorable soil formation. The lime-containing blocks move in total during an earthquake, thus the development of larger cracks is prevented, a fellow geologist explained. The epicenter of the quake was probably near to the city of Samara in the province of Guanacaste, where the earthquake took place in about 40 km depth. 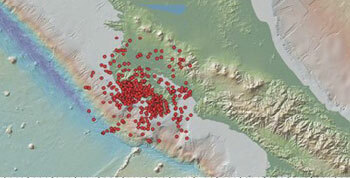 The quake could be sensed in the neighbour country Nicaragua, as well. The tsunami warning that was issued automatically as a result of the quake, was canceled after a few hours. Luckily the earthquake occurred at about 9 clock in the morning when people were not so asleep anymore and could find shelter. The damages were as already reported relatively small. The Church in Nicoya, which originates from 1544,thus is the second oldest building in Costa Rica, and whose walls consist of limestone, was damaged. The damage is estimated at $ 200,000, an amount that is relatively low considering the age and condition of the building. For many tourists, it was a big shock to experience an earthquake, the concern was great. Already booked flights were not taken. But no worry, the hotels in the region of Guanacaste reported only minimal damage, the situation got normal quickly. Jose also works for a German hotel which is located close to Samara. In the Hotellodge Samara Costa Rica the situation remained calm, as well. A water line was broken, few bottles and some ancient Mexican vases, but there was no further damage and all hotel guests are fine. Furthermore, we recommend a very innovative hotel and lodge in Costa Rica on the Pacific coast near to Samara. Wanna live on an exotic dream beach in a natural paradise?